*Disclaimer: Travelling with young kids is different than traveling with babies. I have yet to cross the bridge and my experience deals only with the ones that poop themselves. 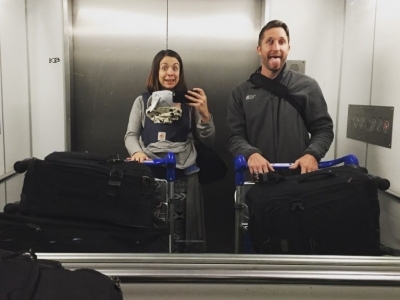 Traveling with an infant sounds either glamorous (to those without kids) or like a harrowing act of bravery (to you fellow parents). 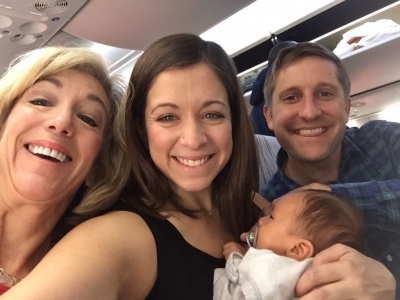 If my husband and I can survive a 30-hour travel day with an 8-month old and enjoy our trip, you can too. We found out I was pregnant a few weeks before moving to Tanzania, Africa. Maternal healthcare is questionable there, and we decided it best to travel to South Africa to give birth to our son. Our first trip with him was to fly home when he was five weeks old. We have since moved back to Baton Rouge and made three cross-Atlantic flights with travels along the way. At fourteen months old our son has travelled more than I did in my first 21 years of life. All of that to say we tried it because we had no other choice. We have learned that while travel with a baby is different, it’s also completely doable and a new adventure. little one, and others who ask us for tips for long flights. So, here are my tips for the brave souls who not only embark upon the adventure of parenthood, but also the wild ride of travel with a baby. Book travel around baby’s nap/sleep time. Overnight flights are our absolute jam. If that isn’t possible, we aim to schedule during a naptime, everyone is happier. This is our favorite way to book accommodations anywhere in the world. It is so nice to have your own small apartment or house so everyone feels a little more settled. We usually end up saving money as well. With access to a kitchen, we are able to visit a local grocery and prepare our own food. We look for a place in a neighborhood with good restaurants where we can also pick up food in case our son is too tired to go somewhere. This is the most basic and important. Pack all the snacks. For you, your little one, and even your airplane neighbor the baby is kicking. Make sure to pack extra in case of delays in your plans. Nothing is worse than a hungry little one… or a hangry parent. We love our Ergo Baby Carrier. I legitimately have no idea how people even got through airports with babies before them. You will be tempted to pack everything you own. Try to slim it down. You really need less than you think for a trip. 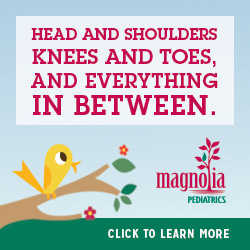 Pack enough diapers for the travel time, but plan on buying more when you arrive. Only bring a few lightweight toys, not the wooden block set. Some people think we are crazy for this one, and maybe we are…we have gone so far as to use our suitcase as a crib when traveling without a pack n’ play. And it worked...until he was able to crawl out. We like to fully experience places we visit but quickly learned we can’t do everything in a guidebook when traveling with a baby. Expect shorter days with naps factored in. Maybe you don’t see all the sights, but you might find joy in a different kind of adventure. Most parents I know aim to find a fun local park and experience life the way other parents in that city do. 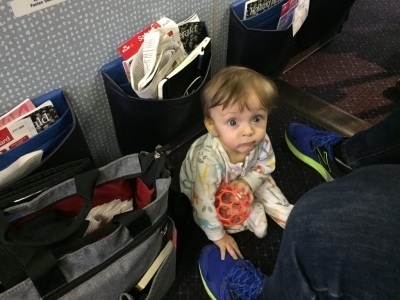 There is a moment that is bound to happen in which your tiny sweet babe will have some form of a meltdown in some public setting, probably an airplane. Because what better place for the meltdown of a lifetime than a sardine can stuffed with humans rocketing through the air? Babies have impeccable timing. In that moment, you will try every trick in the book. You will pace the crowded aisles bouncing, nursing, giving them a bottle, giving them snacks, singing embarrassing songs in front of total strangers staring at you blankly, dancing, or passing them off to your spouse in exasperation. Sometimes that works, and other times the source of their cries may as well be the Da Vinci Code and you are no Tom Hanks. In that moment your mind will be racing, “WHAT WERE WE THINKING COMING ON THIS TRIP?! WHO DID WE THINK WE WERE? WE ARE NOT SUPERHEROS. WE ARE NOT INSTAGRAM WORTHY RIGHT NOW. IM SWEATING. IM EXHAUSTED. EVERYONE ON THIS PLANE HATES ME.” In that moment, here is what you do: you stop and breathe. Then remind yourself you are a superhero. You are literally flying through the air. So, take that, Superman. People crammed on planes are typically really helpful and kind. Plenty of them have kids or know kids and realize this is just part of it. They usually just feel for you. And the ones that don’t just need to slip on their noise-cancelling headphones and take a nap. These are just the few, most basic tips to get through what I am sure will be a worthwhile adventure of travelling with your own tiny human! What are your travel tips?